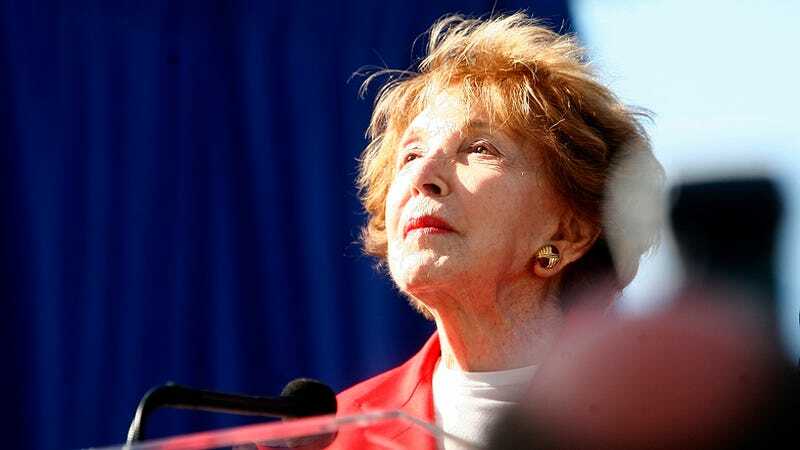 Nancy Reagan, who has long been regarded as the force behind her husband former president Ronald Reagan’s political career, as well as a public figure of her own making, has passed away at the age of 94. According to Joanne Drake, a spokeswoman for Reagan, the former First Lady died of congestive heart failure at her home in Los Angeles. Born in New York and a graduate of Smith College, Reagan first rose to prominence as an actress in Hollywood during the late 40s and early 50s under the name “Nancy Davis.” She met her future husband actor Ronald Reagan in 1949, an actor who was then serving as the president of the Screen Actors Guild. After Mr. Reagan shifted his career from acting to politics and served as governor of California from 1967 to 1975, Nancy Reagan sought out her own philanthropic pursuits, working with veterans and people living with disabilities. Despite early missteps, she was able to turn her image around with the help of incorporating humor into her public interactions for the remainder of her husband’s two terms, remaining his biggest supporter. Reagan continued to champion certain causes during her White House years, most notably launching the “Just Say No” campaign in 1982, which included filming a number of PSAs targeted at children that cautioned about the destructive nature of drugs. On top of the PSAs, she even did a cameo on the sitcom Diff’rent Strokes. Public figures—especially members of the GOP have shared their condolences on Facebook, Twitter, and other forms of social media. Current GOP candidates Ted Cruz and Donald Trump also took to Twitter to express their sympathies.